Prior to enrollment in this program, background checks are required. Valid FOID cards are also required for Illinois residents only. Gunsmithing provides training in custom gunsmithing and gun repair, and develops the basic knowledge and skills needed to become a professional gunsmith. 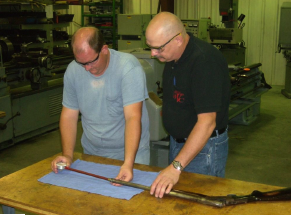 Laboratories that support the gunsmithing instruction are the Machine Tool Lab, Welding Lab, Gunsmithing Instructional Lab, Bluing Lab, Metal Finishing Lab, and firearms vault. Completion of the program includes coursework in firearms design and function, stockmaking, bench metal work, machine metal work, gun bluing, and metal finishing. The program also includes gun safety, Bureau of Alcohol, Tobacco, and Firearms background checks and licensing, state and federal rules and regulations, ethics, etc. Students must be at least 18 years old to enroll in this program. Students are required to provide a basic set of hand tools. Employment – Small business ownership; retail and sporting goods’ stores, firearms manufacturers, governmental agencies, and hobbyists.